Some years ago the bass player in my band gave me a small Hohner accordion. I played with it a while, then put it on a shelf. There it stayed until earlier this year, when I read “Accordion Crimes” by E Annie Proulx. The book traces the adventures of a small green button accordion as it passes from hand to hand in the USA, over more than a century. A wonderful read for musicians, and anyone. I got my accordion out. The similarlity with the harmonica is striking, the details follow. The picture shows a 10 button keyboard. This essentially means 10 holes, like a harmonica. 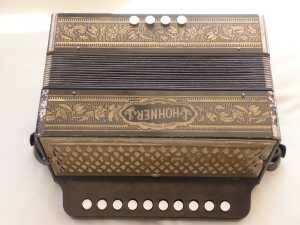 The button accordion is diatonic, meaning that it is tuned to one key (more or less). Also, like the harmonica, a different note plays for each button (hole) when the bellows are pushed or pulled. Just like the blow and draw on a harmonica. The single row 10 hole accordion shown here is the simplest member of the accordion family. There is a sub group of accordion players who specialise in the single row instrument, it is widely used in Cajun and Canadian traditional music. Other diatonic accordions have multiple rows, each tuned to a different key. Much like holding multiple harmonicas at once, rarely done by Western players, often done by Asian tremolo players. Two row and three row accordions are common, the former with Irish players, the latter with TexMex players. The button accodion, box, or melodeon (the English name) is different to the piano accordion, where the piano like keyboard plays the same note regardless of bellows direction. Anyway, back to harmonica similarities. It turns out that Hohner is the leading accordion manufacturer, just like the harmonica world. Moreover, there is a Hohner accordion equivalent of the Marine Band, namely a classic instrument with a long history and known faults. Although loved by generations, the Marine Band comb swells and contracts with the weather, the nail construction techniques is definitely old school. The Hohner accordion equivalent of the Marine Band is the 2815 Vienna 2 row series, otherwise known as the “Pokerwork”, due to the gold scroll and black paintwork on the body. My single row instrument, known as a 1040, also has the Pokerwork decoration. The 1040 is now longer made, however the 2 row Pokerwork is. They appear regularly on eBay, with some models dating back to the 30’s, available quite cheaply. The Hohner Pokerworks are known as simple and loud instruments. Like the Marine Band they have their quirks, one being that the keys disappear into the holes when pressed down. This slows the fingers, a common mod is a block of wood fixed under the keys to limit the travel. Holes 1 to 9 on the accordion are the same as holes 2 to 10 on the diatonic harmonica. Notice the repeated G at the bottom, just like the standard “Richter” tuned harmonica. The harmonica pre-dates the accordion, so the harmonica tuning was almost certainly borrowed. So much for similarities. Now the differences. First, no bent notes. In particular, there is no A at the bottom end, a note common to many tunes, available on as a 3 draw bend on the harmonica. I miss this note, and am seriously considering tuning up the bottom draw G to get it. A common modification, apparently. The other difference is the 4 chord buttons. The first gives a C chord on the push (blow), a G chord a on the pull (draw). The second button is a C bass on the push, G bass on the pull. The third button is an F chord for both push and pull, the fourth an F bass on the both push and pull. In other words, a I, IV and V chord. Given my familiarity with harmonica layout, the single row 10 button accordion should be simple to play. *! @% no! Coordinating my left hand bellows (breath) with my right hand buttons is hard. Really hard. Next festival I’ll pay close attention to the box players, rather than distancing myself to get acoustic space for my harmonicas. I’m drawn to this instrument, my music friends are bemused. Nonetheless, I’ll stick with it.